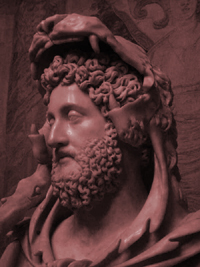 Commodus was the son and successor of Marcus Aurelius. In 180, reversing his father's foreign policy, he concluded peace with the German and the Sarmatian tribes and returned to his licentious pleasures in Rome. There he vaunted his strength in gladiatorial combats and decreed that he should be worshiped as Hercules Romanus. He changed his own name to Marcus Commodus Antoninus and wanted to rename the city of Rome after himself. As generous and magnanimous as his father was, Commodus turned out to be just the opposite. Commodus, being the son of Marcus Aurelius, was one of the best prepared Roman emperors in history. Unfortunately his intent was not to rule, but to bask in a life of wealth and luxury. He neglected matters of state, He appointed his underlings to administer the Empire, and shared in the money these men stole. The months of the calendar were all renamed in his honor. Most likely less insane and more likely impetuous and spoiled by a life of complete power and luxurious self indulgence created Commodus. Many plots to assassinate him failed, but eventually, on the order of his advisers, he was strangled by a wrestler a day before he planned to march into the Senate dressed as a gladiator to take office as consul. Upon his death the Senate passed a damnatio memoriae on him and restored the proper name to the city of Rome and its institutions He has succeeded by Pertinax.